Help your clients to overcome an addiction to sugar and enjoy a healthier lifestyle. Sugar is a toxic substance that can cause tooth decay, obesity, diabetes, heart disease and cancer, and according to researchers it is as addictive as cocaine. If your clients need help breaking this habit, this Forget Sugar Addiction hypnosis script can help. The script uses an indirect approach to target the subconscious mind and avoid resistance. 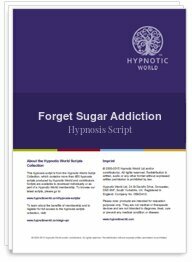 Download this Forget Sugar Addiction script today to add to your collection of hypnosis scripts.